Today NATO handed off operational security responsibility for all of Afghanistan to the Afghan government, a dramatic turning point in the war that began in the days following September 11, 2001. But as a former member of the NATO International Staff and informal scholar of the organization, I can predict what will happen next: a series of box-kit essays by academics on the make about how NATO has outlived its original purpose and, of course, an entirely contradictory set of kippered set pieces about how NATO has utterly failed to bring about a stable, secure and prosperous Afghanistan. More Ph.D.’s have been converted to fellowships and tenure-track positions on NATO’s back than I have patience to count. It’s considered gauche to issue bald declamations like the one I’m about to state, but I’m going to do it anyway in order to illuminate my point: NATO wins again. There will be the usual NATO naysaying nabobs out there who insist on believing that 28 Western democracies can’t find consensus to order lunch, much less how to rout a remorseless 14th-century insurgency. And lest some believe the war is lost – the transfer ceremony itself was marred by a bomb attack – remind yourself who’s running the government, security services, borders, businesses, NGOs, mosques, universities, schools, hospitals and clinics. And then remind yourself who, exactly, requested peace and reconciliation talks with the Americans from their office in Qatar. The Cold War, Bosnia, Kosovo, Libya, Afghanistan. Never in history has one organization, over so long a period, prevailed over such a diverse array of adversaries. No one should doubt the ability, creativity, and tenacity of a group of like-minded democracies bound by an oath of common defense. That such defense could extend as far as the Hindu Kush is testament to all the NATO Member countries – and nearly two dozen partner countries – committed to supporting Afghanistan in the years ahead. Because NATO is an alliance of values, rather than of interest or convenience, the organization has endured longer than the leagues and ententes of generations past. And because its founders recognized NATO’s political significance foremost, its strength has always been political first and last. These are the two most important attributes the organization’s detractors consistently miss. Yet they are what set NATO apart and guarantee its success – and our security – for the future. 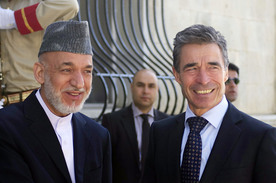 This entry was posted in Afghanistan, North Atlantic Treaty Organization, Politics and Political Theory, The Former Yugoslavia and tagged Afghanistan, Anders Fogh Rasmussen, Barack Obama, current-events, Hamid Karzai, NATO, politics, Taliban. Bookmark the permalink.